Looking to add a dash of greenery to your bedroom? Even if your thumb is closer to black than any shade of green, you can find plants that are low-maintenance and don’t require a lot of TLC. Let’s look at a few easy-to-maintain plant options that will add a breath of fresh air to your bedroom. Calling first-time gardeners – the spider plant might be for you. Give your plant indirect light and well-drained soil and it should do just fine. Make sure your room isn’t too warm, since spider plants like temps in the 60s. If your spider plant is getting brown tips, try using distilled water or rain water rather than fluoride-filled tap water, and that might take care of the problem. 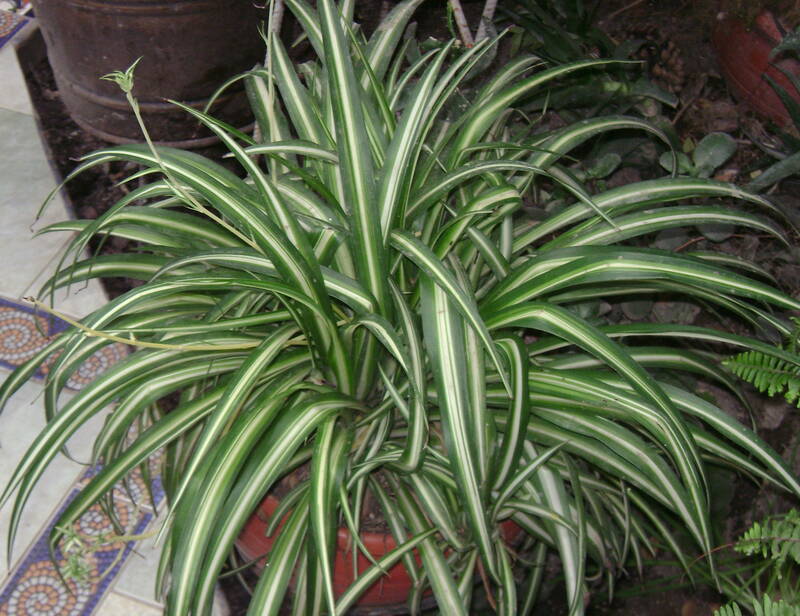 Spider plants can get unruly, so don’t be afraid to prune your plant as needed. Need good luck? Then you’ve come to the right plant! Jade plants like full sun, so they’ll prosper in bright bedrooms. How do you know if your jade plant is getting enough sun? If it gets bare and leggy, then the plant is not getting enough light. 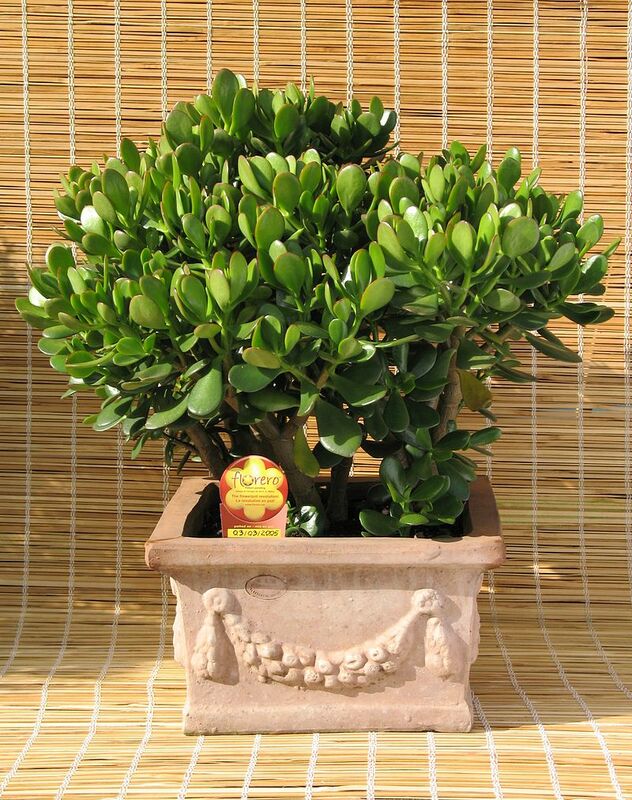 Plant jade in a terra cotta pot, and use a water soluble fertilizer about twice per year. Brighten up any bedroom with this elegant deep green plant. 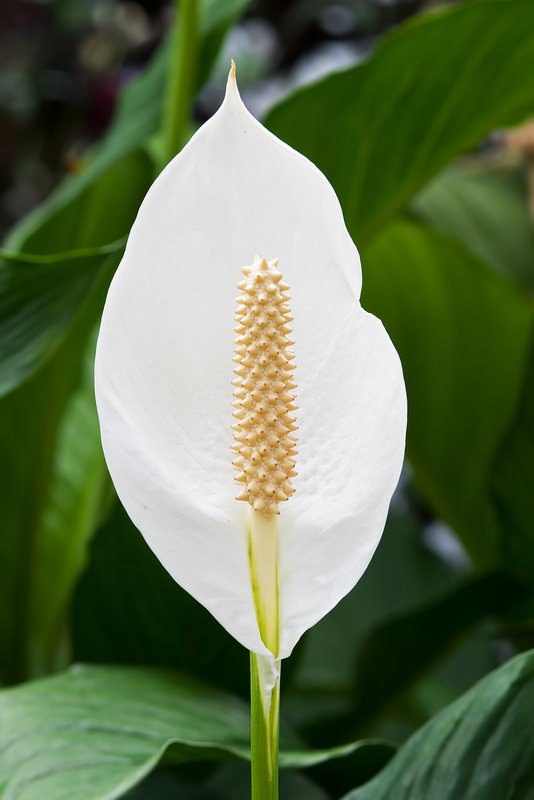 Drought tolerant, peace lilies need little water and thrive in low to medium light. Check the plant’s soil weekly, and only water as needed. Its large leaves will get dusty, so be sure to give the plant an allover spritz or a wipe down. If your bedroom gets a healthy dose of sunlight each day, then the Areca palm is a good choice. 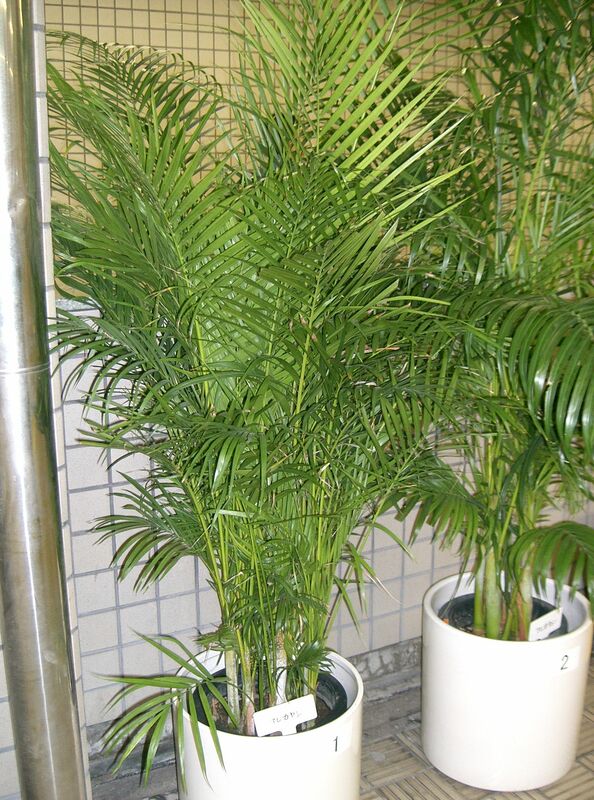 A NASA study chose this palm as one of the top air-purifying plants. Lend a tropical feel to your room with this graceful, easy-to-grow palm plant. 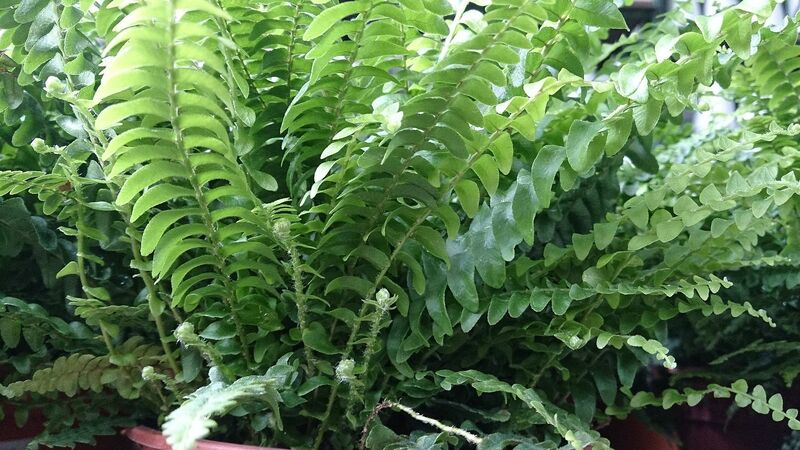 This lush fern prefers medium to bright light. Although you’ll most often see Boston ferns as large hanging baskets, it’s not uncommon to see this happy plant in a small decorative pot. Hint, hint. I prefer the smaller versions for indoors, and leave the oversized hanging baskets for outdoor spaces. For more info on these plants and other options for your bedroom, visit http://www.gardeningknowhow.com/. The 4th of July is a day for Americans to celebrate our nation’s independence, but it’s also a day of picnics, outdoor parties, and festivities in red, white and blue. 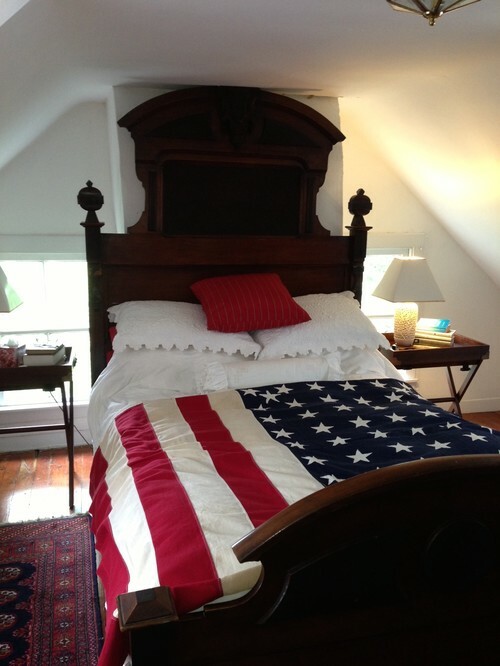 In the spirit of our nation’s history and the American flag, let’s take a look at some colorful, patriotic bedrooms. A subtle tone-on-tone stripe on the wall, layered pillows and shams, and vintage accessories successfully pull this bedroom together. The blinds place even more emphasis on the stripe theme. Notice the small stars in the windows on the bed wall. 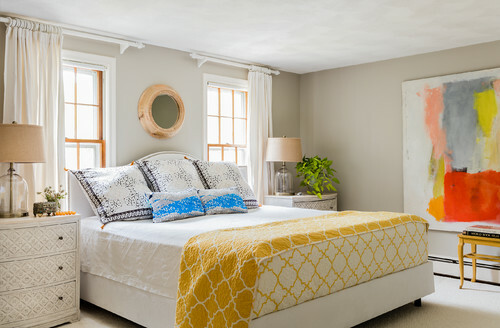 This colonial beach bedroom in Santa Barbara boasts mixed patterns and a country feel. The quilts, painted walls, antique-looking bed, watering can lamp base, and the basket of hydrangeas add to the room’s relaxed style. This charming little bedroom combines rustic with modern, and so well. 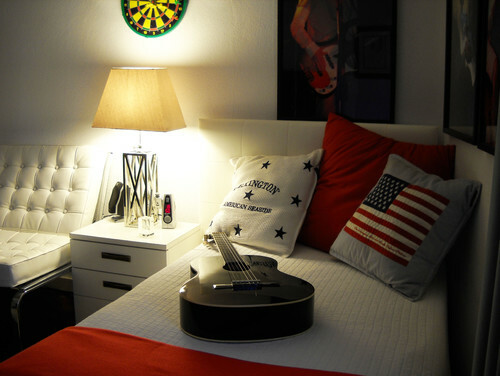 The room could easily take on a different theme by switching out the pillows and dartboard. 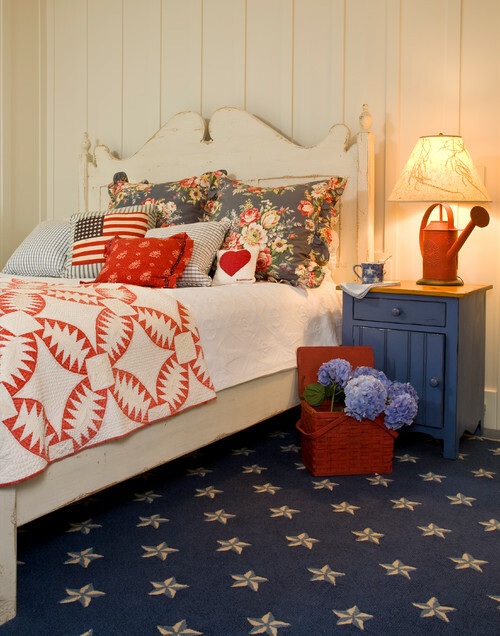 A Boone, North Carolina bedroom celebrates the American flag. 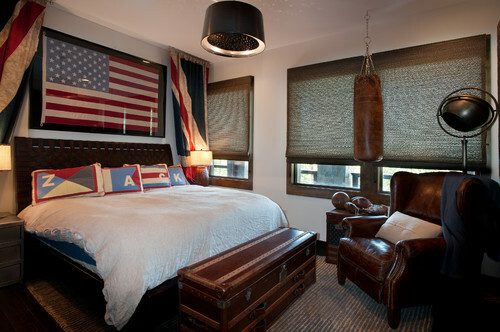 With leather, dark wood, and ZACK pillows in red, white and blue, this rustic boy’s room is fit for a king. Dianne Davant and Associates designed the space. I love the simplicity of this farmhouse bedroom in Maryland. 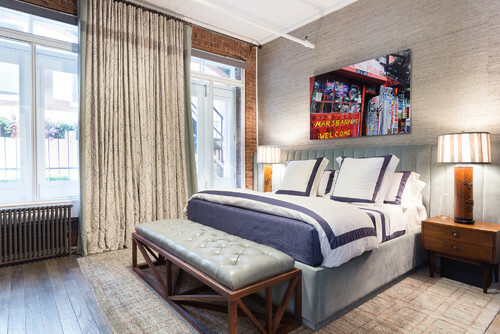 The headboard is tall and stately; the American Flag makes a real statement at the foot of the bed, and the remainder of the furnishings are understated. The antique accent rug adds the perfect amount of pattern. 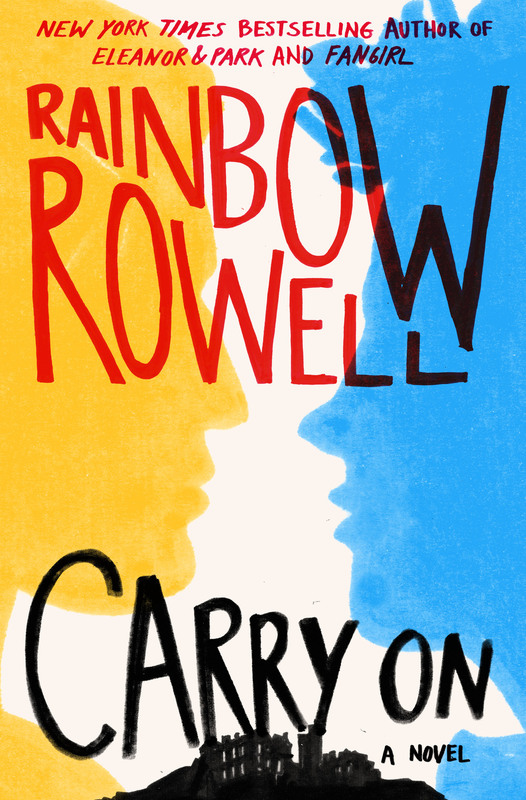 Carry On by Rainbow Rowell. I’ve never read a book like this before. If it hadn’t come from someone whose recommendations I hold in high regard, I doubt I ever would have approached it. The novel is kind of a piece of make-believe come to life. In Rainbow Rowell’s Fangirl book, Gemma T. Leslie writes a series of Harry Potter-esque fan fiction stories about a young man named Simon Snow who attends Watford, an English school of magic. Fangirl introduces us to the stories of Simon Snow and his nemesis/roommate Baz and their years together at Watford. Carry On brings all those stories into conclusion as a standalone novel in which Baz and Simon finish their seventh and final year at Watford. Upon beginning the book, I felt there was something I was missing because I’d never read Fangirl but Rainbow Rowell does a good job of filling in all the pieces you need to make this novel work on its own. Simon is a child without parents, raised in the nonmagical world (sound familiar? Remember, this is meant to be fan fiction) and is discovered by the head of Watford, where he is taken in. Simon is incredibly powerful but has almost no control over his power. Half the time his wand doesn’t even work. Other times, his spell will affect not only the person in front of him but everyone within a wide range. Simon’s roommate is Tyrannus Basilton “Baz” Pitch. Simon’s pretty sure Baz is a vampire but can’t quite prove it. Either way, Baz has spent years trying to kill Simon and Simon can’t wait to be done with all that. I can’t say much more about the story without spoiling it but if you or a teen you know wants a book full of magic, monsters, and the occasional makeout session, Carry On is a wonderfully clever and enjoyable story. In my opinion, warm weather is the ideal time to redecorate. Most of us are in a better frame of mind when our bones are warm, so our creative juices are more likely to flow at full speed. 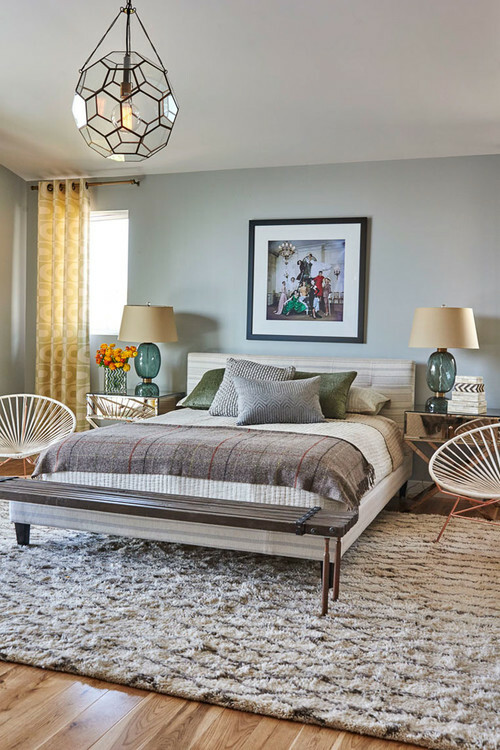 Whether you’re looking to spruce up your accessories, brighten your bedroom with a paint color, or take on a complete overhaul (perhaps you’re really ambitious! ), this season is a fabulous time to rethink your décor. 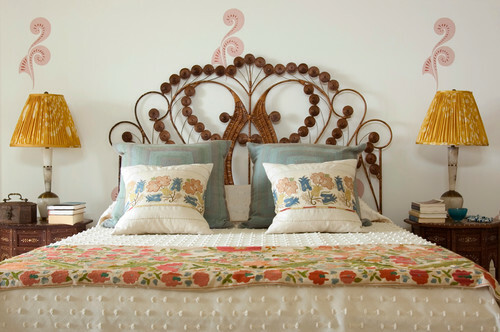 Here are ten summer decorating ideas to try in your bedroom. 1. Hang black and white prints for a timeless yet modern aesthetic. 2. 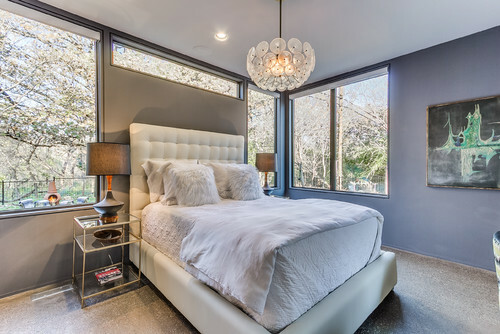 Add new light fixtures for ambience and task lighting. 3. If you’re funky and adventurous when it comes to decorating, play with faux fur. Pillows are a terrific place to start. Photo by Gary Randolph “Masterbuilder”, Inc.
4. Paint a decorative pattern or stencil a motif on your walls. 5. Go bold in your artwork and make it a focal point in the room. 6. Tired of neutrals? Add color in more than one place. Perhaps you should start with a splash on the bed, and then move on to the accessories. 7. Want to redecorate, but on a budget? Get thrifty and try flea markets, where you’ll discover fantastic finds at affordable prices. 8. Splurge on a new area rug. Choose a soft yet durable style. 9. Update your window treatments. Curtains can give new life to your bedroom. 10. Invest in a new headboard. Why? Because you deserve it. 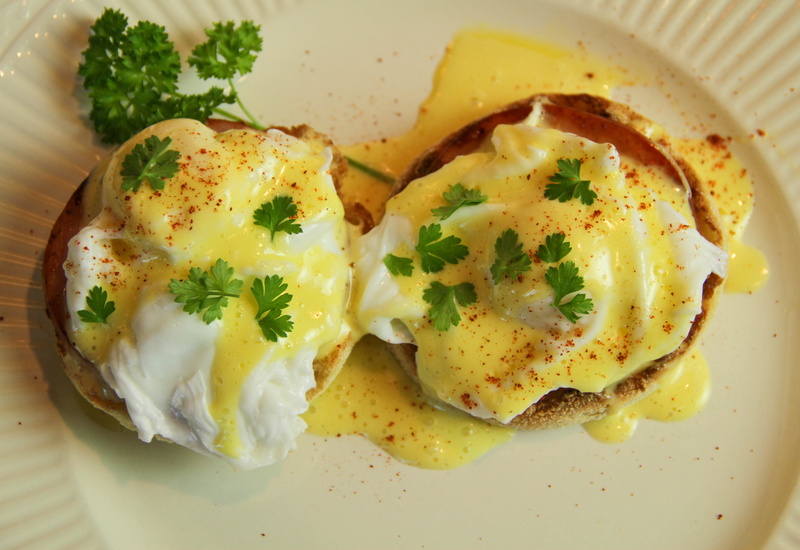 Preparing Eggs Benedict is not difficult; rather, it’s a little complicated. Too many things are happening at once. Should I worry about my muffins toasting or my eggs poaching? My bacon browning or my Hollandaise emulsifying? Well, the sad truth is, all these things must be tended if you want to have your muffins crisped, your eggs gooey, your bacon browned and your sauce hot, all at the same time. This is the occasion to ensure your “mis en place” is well-executed. Assemble your ingredients, gather your pots and pans, perhaps enlist an assistant. Then toast, boil, brown and drizzle your way to a worry-free breakfast in bed. Split muffins in half and place in toaster. Toast when other preparation is completed. Eggs should be as fresh as possible for perfect poaching. To poach eggs, fill a heavy saucepan with enough water to cover eggs (3 to 4 inches) and heat until very hot and simmering, but not boiling. Break eggs into individual small dishes. Or you can use an egg poacher. Carefully pour the first egg into the simmering water. Immediately use a wooden spoon to wrap the cooking white around the egg yolk to prevent the white from feathering. Repeat the process with the remaining eggs, and cook for about four minutes, until the white is firm but the yolk is still soft. Remove from pan with a slotted spoon and drain. Trim edges if necessary. While eggs are poaching, heat a small pan over medium heat. 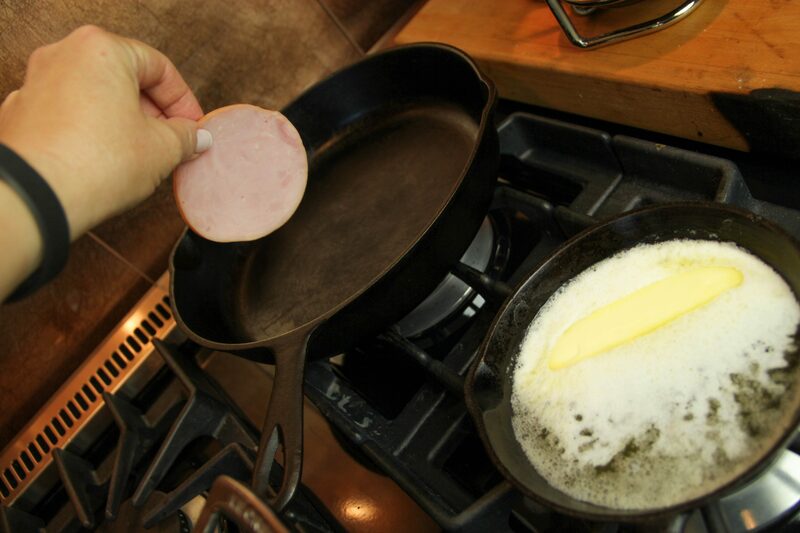 Add Canadian bacon and cook until warmed through and slightly browned. To assemble, place two muffin halves on each of two plates. Place a slice of Canadian bacon on each muffin half. 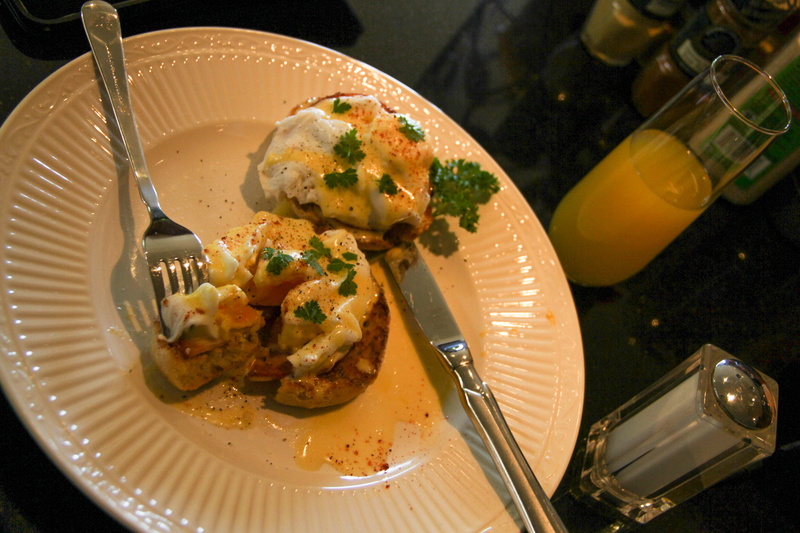 Then top each with a poached egg and drizzle with Hollandaise sauce. Garnish with fresh parsley and serve immediately. Melt the butter in a small saucepan until it is bubbling hot. 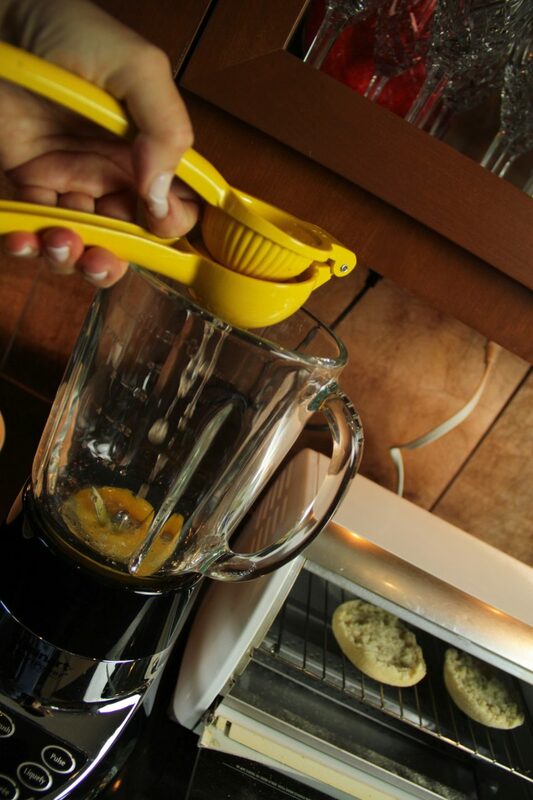 While butter is heating, combine egg yolks and lemon juice in a food processor with a couple of quick pulses. 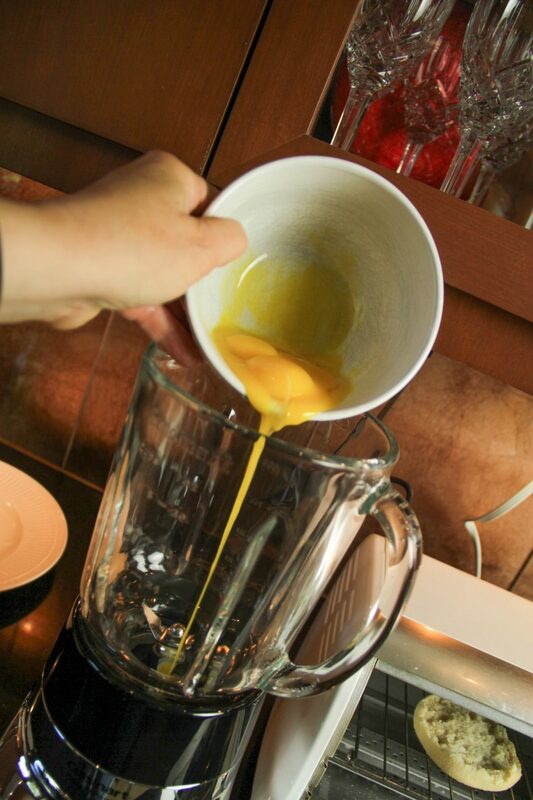 With food processor on, slowly stream in the hot butter until Hollandaise emulsifies. Add a pinch of cayenne pepper and pulse the Hollandaise one more time to combine.